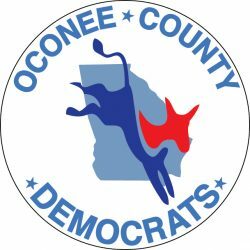 We are the Oconee County Democratic Party Committee. Our mission is to find, encourage and support Democratic candidates in Oconee County, GA. In addition to voting members, the OC Democratic Committee can have an unlimited amount of non-voting members. Anyone who considers themselves “a Democrat” – however you define it – is welcome to participate in meetings, events, and serve on our sub-committees. The OC Democratic Committee meets on the 3rd Thursday of each month, though not usually in December or in July. Meetings are held in the basement of the Oconee County Chamber of Commerce and begin at 6:30 pm. (Walk down the stairs on the left side of the building and around the back to enter the basement meeting space). The first half of the meeting generally includes one or more guest speakers and/or presentations, after which the Committee will conduct its business meeting. Both parts of the meeting are open to the public and visitors can come for the speakers only or stay for the whole meeting. We invite anyone who is interested to join us! For a more casual way to get involved, the Oconee Democrats host our Social Hour on the 2nd Tuesday of every month at The Pub On Main in downtown Watkinsville from 5:30-7:00. No business is conducted here, just an opportunity to have some great food and drinks with like-minded people here in Oconee. The social hour is always a great time. The Pub on Main is even kid-friendly, so no need to find a sitter! The OC Democrats are always involved in local events – especially during election season! From helping to organize fundraisers for candidates to participating in canvassing and other community events, we try to make our voice heard! Be sure to check out our Calendar page, our Facebook page for information on events, and subscribe to our mailing list to stay informed.